Some steps like the package-rebuilds and the repository creation which are shown in the examples below could be ommited and/or simplified by doing QA for Fedora bugs #512, #559, #560, #571 and #599. The sample(s) below are assuming a Red Hat Linux 9 installation with the apt package from the Fedora Linux Project and a vserver-capable kernel. Note: Depending on your system, some paths may differ, and for the second step you will need write-access to the /usr/src/redhat directory. Note: In contrast to the vserver -tool of the original vserver-package, this command will not copy the host-system filetree into the vserver, but creates some directories and inodes only. Note: there must be used senseful values for IPROOT and S_HOSTNAME . # echo "rpm file:$D redhat minit" >>$vdir/etc/apt/sources.list"
Note: The last step disables GPG signature checking since our repository/our packages are not signed. In production-environments, it is strictly advised to use signed repositories and to keep this setting enabled. Note: the middle two install steps are required because of packaging-bugs in some RHL9 packages (insufficient pre/post requirements). 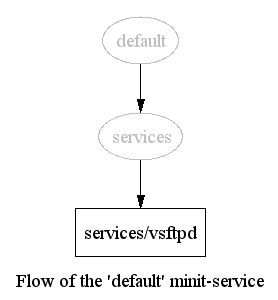 The first command adds the VSERVER stop-method as the last command for ctrlaltdel/ (shutdown), and the second one adds 'vsftpd' as a service which will be executed. 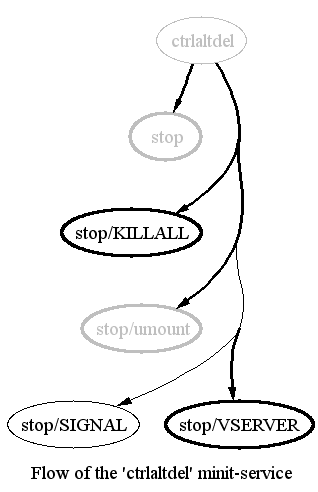 There are existing graphical representations of the startup and shutdown flow also. On recent hardware, the restart command should not take more than 7 seconds .